This was written September 22, 2000. This is now March 28, 2013. 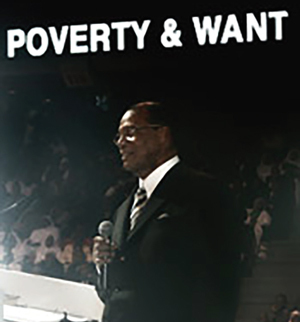 The Honorable Minister Louis Farrakhan has made it clear, time and again, that our attitude—in all circumstances—is a major factor in energizing us to do what we must do, to properly relate to self, kind and others, in order to realize our potential. Moreover, Minister Farrakhan has set an inspiring example of the principles involved in self-development and proper attitude. The lessons he has taught on this subject will prove more valuable than ever, in the upcoming weeks and months. Even when we do not see all that Allah has done, and is presently doing for us, the proper attitude towards Him is an absolute requirement for us to be benefited by His blessings; chief of which is divine guidance to become ourselves, by becoming like Him. Obviously, we must first be convinced that Allah exists. If we doubt this most fundamental of all facts or truths, we will doubt that He hears our prayers. Again, do we know enough about Allah’s nature, character and power to be convinced that He is always true to His own nature? Do we have confidence in the integrity of God? Our attitude towards Allah, profoundly influences not only our attitude towards everyone, but also our power to act on His word, especially when we are not in trouble, which is seldom, in this evil world. If we don’t have confidence in His integrity, we cannot achieve oneness with Him. We won’t be able “to please Him,” nor will we “diligently seek Him.” Then we’ll become remote from Him. Remoteness from God is the nature of hell. Our view of the reality of the nature, the character, aims and purposes of the true God, determines how clear we see that which comes from Him. That which comes from Him includes His instructions and all those means He has granted us, to improve us, which often includes persons who taught and teach aspects of His will to us. Minister Farrakhan is from the Supreme Ruler of the universe and from the Christ of the scriptures. Now, even when certain knowledge and events that come from God are not immediately understandable to us, the question still is: Do we trust Him? One thing is clear, we will quickly become like a wishbone in a turkey if we continue straddling the fence, pretending to serve both God and His enemies. This cannot be done without suffering that which wishbones in turkeys must suffer, sooner or later. Certainly, justice is the basis of the coming of God. We are fortunate to be living now when this world is going out and the one God promised is being grown right here in the United States of America. Many of us are under the misconception that even after learning God’s truths, we should not experience injustices. That’s being immature. It is unnatural to think justice was to be set up instantly. In fact, God factored injustices into His plans to grow us. Now when we are deprived of justice (in whole or in part, by one or ones, who are evil, or both good and evil, or seemingly all good), and regardless of the quality of the understanding and the intentions of the one or ones who treated us unjustly, and regardless to our own faults in the matter, and even in those few instances in which we are totally without fault, the most vital factor is this: Allah’s hands are always over the entire matter. Muslims are always convinced that Allah’s hands are always over all hands. Muslims are always convinced that Allah is always working out things in a way that is best. Nothing escapes His attention. He is perfectly just and true. Furthermore, He has the power to bring about the best for us. So, Allah’s involvement in withholding what is really our due is always for reasons that are best for us. Too often we narrow our focus on the one or ones we see as responsible for our pain. Too often we stop there. However, if we remain too long in the “stop” mode, rather than in the “pause” mode, we stunt our growth. We should interact, with him, her or those who we feel have hurt us—which may only be true in part. The very fact that, for whatever combinations of reasons—good, bad or both—we did not obtain justice, we are being told right then that we must look beyond them to what Allah is doing for us, to have our souls ultimately satisfied. In that critical moment, Allah is signaling, or revealing to us, that He has already determined that He has work for us to do on a higher level, beyond the difficulty of the circumstances in which we find ourselves. So as it is on Him to grant us that which we will need to fulfill whatever is next, it is also on us to cooperate with God. That involves the exercise of our spiritual muscles—all of them. Does this mean that if we had obtained justice, when we thought it was due to us, that God had nothing more or higher for us to do? Yes and no. This is not a complete statement of this wonderful subject. First, I don’t know it all. Second, in either case the situation we’ve discussed tells us we must further purify ourselves to qualify for the next stage of Allah’s blessing on us. Meanwhile, one thing is sure, Allah does not love the qualities of jealousy and envy. Now, we cannot get to the next stage of our growth if we treat those who have mistreated us in an unjust fashion. When we do not improve our attitude, we set ourselves back. When we become unjust while experiencing injustice we are showing ourselves to be unworthy of what Allah would grant to us. However, to be shown this in time is God’s blessing too. If we look deeper, we may see that in this difficult situation is also a God-given opportunity to render a divine service to the other, who did us an injustice! Both can grow. Both can please Allah with their unity after disunity. In addition, we may also help others not involved in our pain. The Holy Qur’an teaches us to: “Let not hatred of a people incite us to act ineqitably.” Muslims do not hate Muslims. Even in extreme cases where hatred may seem to be justified, we are not yet justified to act by others outside the bonds of equity. Look at Joseph, in the scriptures. Look at Minister Farrakhan. Look at the wise and loving way each dealt with their brothers who mistreated them. Look again, at the wisdom of God’s ways through Minister Farrakhan, who, in a most intelligent manner, teaches and warns America, especially against her wrong way of dealing with her most critical and explosive problem. That problem, at its core, involves the state of condition of her ex-slaves and God’s own plans with them, which He will not relinquish. The United States of America has committed the worst crime ever committed by any people or nation against others. She has not yet even taken the first right step to repair the damage she has done to her ex-slaves. What Mr. Jefferson expected would one day occur is now taking place. In the light of Mr. Jefferson’s words, what are the deepest sentiments—on this most explosive issue America faces—of those who wish for the vote of the ex-slave this coming November? What do they think is real justice for the ex-slaves of this country; for the Brown people; for the Red people; for the Yellow people, for others, including the White people, who, in effect, have been disenfranchised in America? How do these questions relate to President Clinton’s inquiry, through a trusted aide at the United States Department of Justice, back in 1991, into the reality of UFO’s? It is not always easy to document, or provide the full context of each statement, or to adequately footnote every assertion I’ve made respecting the mission, message and work of Minister Farrakhan, within the limits of a short article. In this instance you can learn of the source for, and context of, President Clinton’s requests in 1991 about the truth of the UFO’s. Please look at the above that was written.